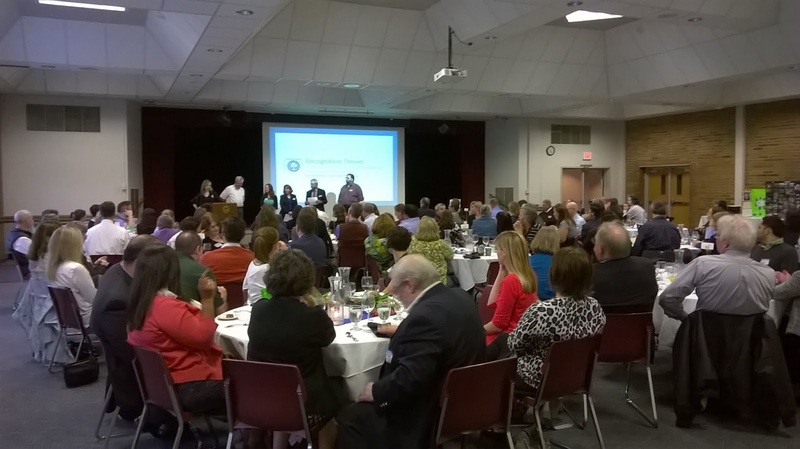 The Shoreline PTA Council 6.12's Recognition Dinner was held on Thursday, April 26th from 6-8:30pm in the Shoreline Room at Shoreline Center. Council Level Awards were presented. Each PTA in the Council presents award for its own PTA and school. Council-level awards are for people who have made an impact beyond a specific school. PTA could not do what it does without amazing volunteers, educators and advocates, and without the support of great local businesses. Each year the Shoreline PTA Council presents a Golden Acorn Award to a volunteer(s) in recognition of his/her dedication and service to children and youth district wide. Shoreline PTA Council recognizes businesses that have contributed product, funds or services to support PTA events and programs throughout the District. The Outstanding Advocate Award is offered by the Shoreline PTA Council to recognize and honor individuals for their advocacy work on behalf of children and youth. On special occasions the Shoreline PTA Council presents The Outstanding Service Award to a volunteer who works for children and youth beyond the bounds of a job, PTA, or a specific school community. This honor goes to a person who has shown concern for all children and who has volunteered his/her time to help them achieve their potential. This award can be presented only by the Washington State PTA and its regions and councils.